Hera Pheri is another of those films that I want to keep in a perpetual state of just having begun, so that I am aware of how amazing it is yet still have more pure joy to experience. It is such a good movie in such a Beth-friendly/-appropriate way that I cannot believe I have not already seen it; simultaneously, it is such a good movie that I wish it were still out there waiting to be seen for the first time. A million kisses to Ness for finally giving me the nudge I needed to procure this top-shelf masala fun. 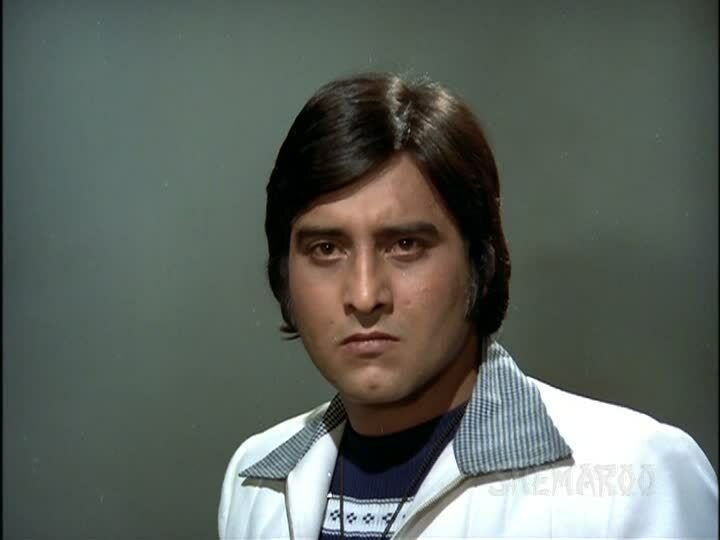 it should be stated that most of my favorite things about this film are related to Vinod Khanna. First, he is screen-meltingly hot. 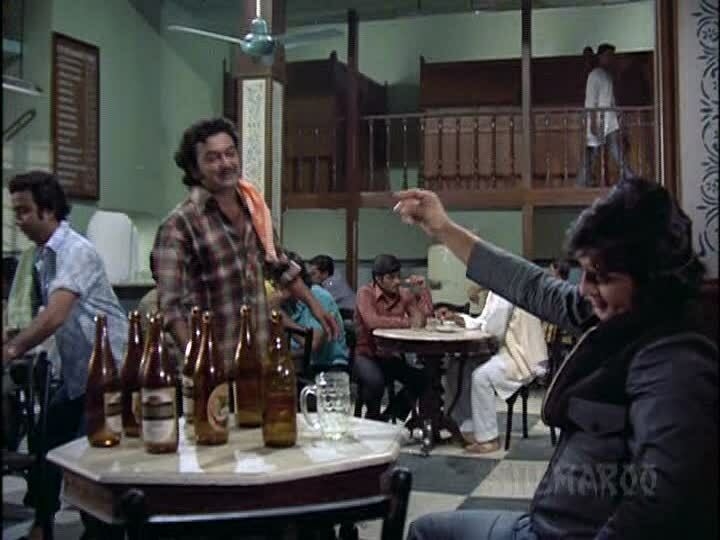 The above scene opens the film, with Vinod (as Ajay) drunk, angry, and somehow swaggering even slumped in a chair. But even better, as Ness said to me while discussing the film, is that his character seems like an actual nice guy. A devotee of Hanuman, he prays more than he drinks. 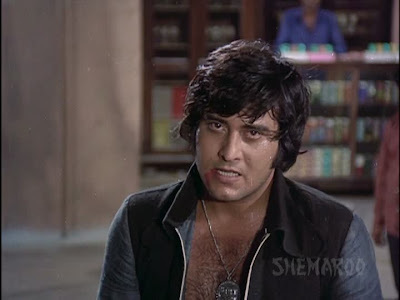 He's so bashful around women that when he saves Sulakshana Pandit (Asha) from goondas who have torn her shirt, he can't even look at her until she manages to cover up the two visible inches of her bra strap, and only after bundling her off safely in a taxi does realizes he didn't even ask her name. He doesn't have any family to speak of and has bonded intensely with Amitabh Bachchan (Vijay). Awwww. Despite my ongoing and attentive research (twenty-five films! 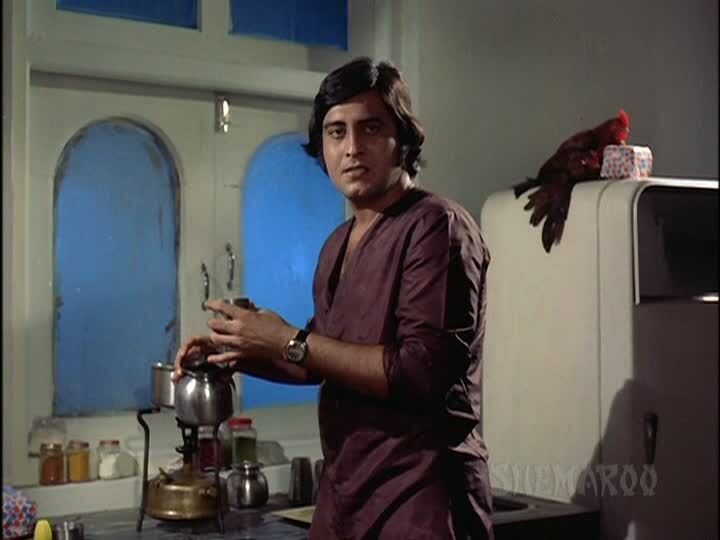 ), I haven't quite decided what I think Vinod Khanna's greatest strengths as an actor are, other than wearing the sh*t out of bellbottoms, but the particular masala mix in Hera Pheri is perfect for him. It's got the badassery and emotional drama of Parvarish but a lot more comedy, at which he is very adept. 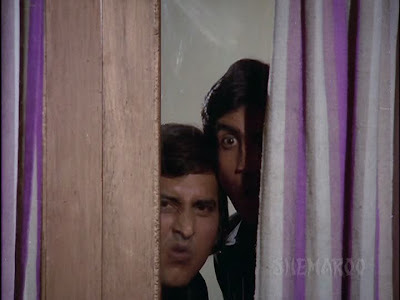 Some of it is physical comedy, like a throw-away moment of Vinod and Amitabh sneaking in an exaggeratedly unsneaky manner into a villain lair or the excellent disguise-laden antics of "Darbar Mein Uperwale Ke," and there are some great nonverbals and facial expressions too. I also think he and Amitabh make a really strong pair generally (Parvarish, Amar Akbar Anthony, Muqaddar Ka Sikandar, Khoon Pasina) and they are beautifully, evenly matched in this, first as allies, then as foes once SIKRITS ARE REVEALED. Look how Ajay reacts when it comes to light that Vijay has a mother he never told him about. What a mix of anger and disappointment. And look how Vijay responds when Ajay refuses to join him in his revenge against his father's killer! 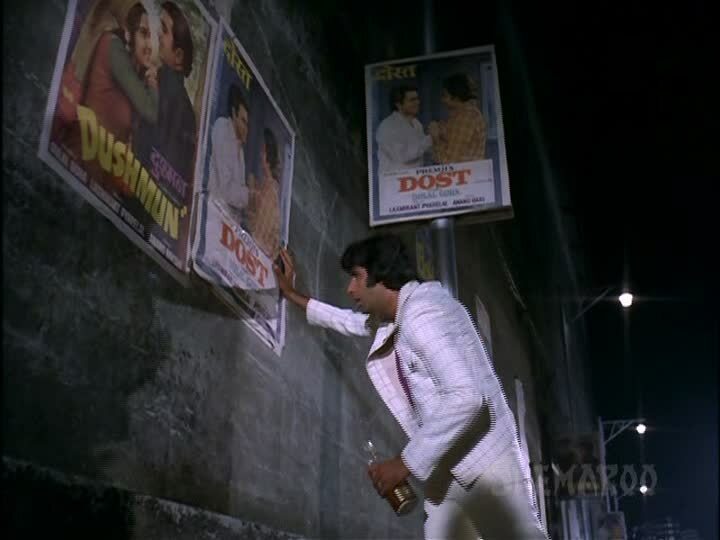 He stumbles drunkenly through a street with posters for Dost and Dushmun (see it in "Barson Purana"). GET IT? IT IS SO IRONIC! IT IS SO POIGNANT! Amitabh too is in his element in a truly impressive way here as well. Everything he does here is an element of why he's the star that he is. I don't really know what to say other than that. Both of these fellas seem to love to perform, you know? Whatever the script calls for, they are doing AND HOW, but not in a hammy or overselling-it sort of way. I wish I could say that the film inspired such range in the female leads, Saira Banu and Sulakshana Pandit. Sulakshana, as Ajay's love interest Asha, is particularly useless in that "she's there simply to give the hero something to be heroic about" type of way that I hate. Saira's character, Kiran (Vijay's love interest), actually figures into the plot as a protagonist of sorts, but somehow I found the impression I formed of her character based on her action-taking much dampened by her schmoopifying* over Vijay. It is certainly possible to have strong, proactive, participatory female leads who are also romantic (OHAI PARVARISH), but somehow that wasn't the effect here. Maybe 70s masala isn't Saira Banu's forte, or maybe creating awesome women isn't the strength, or possibly even an interest, of the writers. Vijay Kaul has the story and screenplay credit, and I have no strong opinion on how women are treated in the two of his films I've seen (Yaarana and Muqaddar Ka Sikandar). And everything else is either solid or freaking fantastic. Dekho! 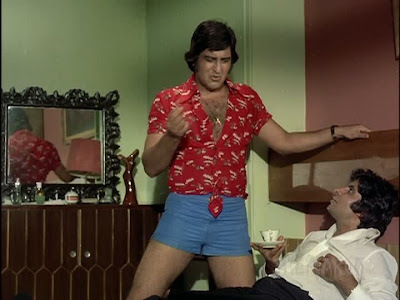 A henchman named Tiger with a bizarre fake eye, whom Vinod fells instantly while wearing peach plaid bellbottoms. We should start a "Mac Mohan photobomb" meme. If you know where this is, pleeeease tell me! My favorite domestic living room/entryway! My new favorite casino! 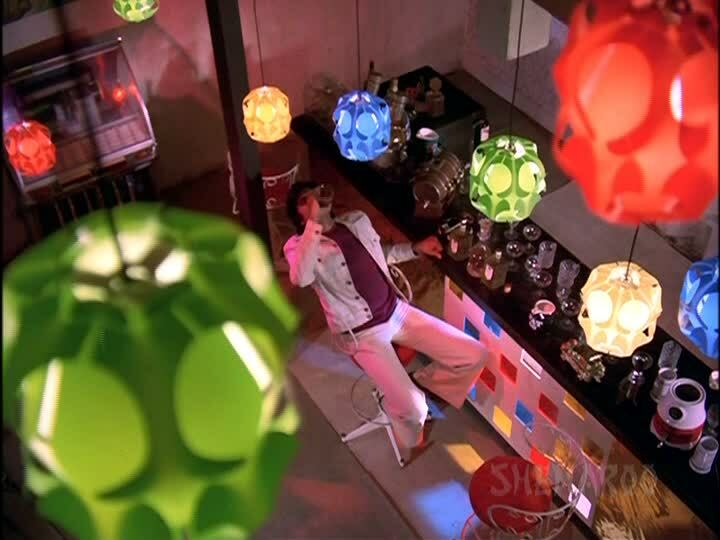 Look at the light-up bar and those groovy pendant lamps! Look at the sign over the door that says "BAR" under some shirtless dude's legs! Look at all the circular pictures among the gilded plaster froofroo! Look at the playing card motifs! 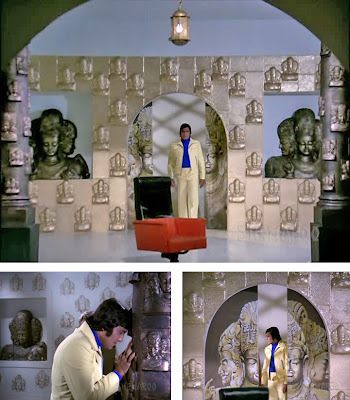 Is this, in fact, a Shiva-themed villain lair**? WOW! If it is, that is incredibly symbolic for what's going on in this scene. GENIUS! PLEASE, Prakash Mehra sir, may I have some more? * Term inspired by Brown Girl Daily. ** Art history lesson courtesy of Samrat. Yaaay finally you came onto the Hera Pheri train! 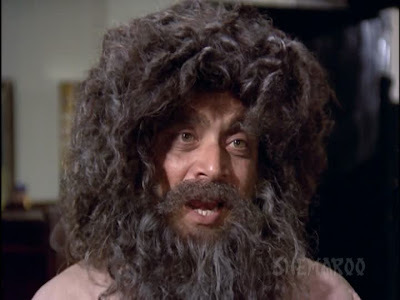 I thought all my previous post on it for Khanna week woulda convinced you but I'm glad you bought it now! 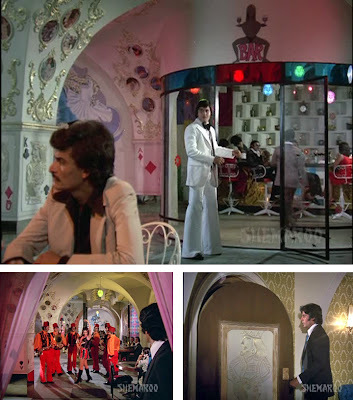 It's such a cracktastic film, I absolutely adore the yogi dance number that the Vinotabh do. Almost a jodi to rival the Shashitabh in terms of complete zaniness and fun! Even if I hadn't read a word of your review, I'd want to watch for the fabulous sets and costumes. 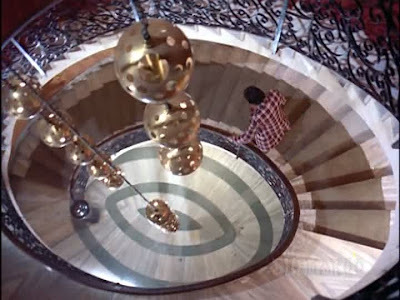 I also realized that a sure sign of being a true devotee of masala is a Pavlovian positive response to the Shemaroo watermark. I only skimmed your review, because your enthusiasm has moved me to add this to my rewatch pile. It's been long enough since I saw it that I can see it fresh, and thanks to your infectious excitement, and the wonderful selection of screenshots, I look forward to doing just that. Thank you! Rum - I am late but enthusiastic! I will have to go revisit your Khanna week posts now - I bet I never read them carefully the first time around because I was so frantic writing myself. It really is a fab film, and I am with you 100% on Vinotabh. Liz - OMG THE SETS. AIEEEEE! As for Shemaroo, I am sure it has led me astray, but not enough to not be excited! Max - Heehee I know the feeling! Enjoy! I like the movie..Good, Really Good..
very nice information of the new movies for new releases bollywood movies please visit the new releases movies site for updated information of the movoies. even with a dead rooster on his fridge... pecking at his Modern bread (We all ate Modern or Brittania Bread in the 70s in Bombay, if not the paav from paavwala). "Look how Ajay reacts when it comes to light that Vijay has a mother he never told him about." Yeah, the look says: What? Tumhare paas maa hai? My emotions are the same as that of Greta! My feelings are the same as that of Greta. Wonder why I never saw this?